Getting an unexpected "balcony day"
It might just happen even during ski season - you never know with mountain weather. Turns out, all that useless information is good for something. Gather by the fire for a round or two. Make plenty, you'll have a hungry crew to feed. Escaping for some "away time"
Bring your book and grab a chair in front of the lobby fireplace for an hour. Everyone dressed and ready to roll? You'll walk to the base in just 8 minutes. Skip the remote parking/shuttle hassle with ski-in/ski-out access. The resorts' outdoor hot tub is the perfect place to relax after a long day on the slopes. Take your mini-explorers out on the Spring Creek Trail, 9 minutes drive away. Brush up on your game at Rollingstone Ranch Golf Course, a 5 minute drive from the resort. Steps from the gondola and ski school, the ski-in/ski-out Ptarmigan House makes potentially complicated mornings very simple. First off, grab seconds on coffee in the lobby – it’s complimentary and perfect for those chilly ski season mornings. Then drop the kids off for lessons before dashing off to the lift lines – you’ll be mountaintop in no time. True die-hards can board the gondola between 8:00 and 8:15 am for special First Tracks access to runs off the Sundown Express, Sunshine and South Peak lifts, as well as the crowd-favorite Priest Creek area (all for intermediate and advanced levels only). You’re a short stroll to shops, dining and entertainment – making it a great place if you’re taking a day off from the slopes or just hanging back with one of the little ones (grab a complimentary Radio Flyer-style wagon!). Pick up a free hot cocoa or cider from the 1880s chuck wagon replica in Gondola Square, staffed by friendly Steamboat Ambassadors a few hours each day. The new outdoor hot tub is a welcome addition, and a must-stop before heading inside for dinner. If you’re visiting during ski season, a welcome bottle of wine greets you inside your studio, studio loft, or one- or two-bedroom condo. Don’t obsess too much about dinner-planning – it has a way of working itself out. Opt for the DIY version in your full kitchen, or grill out on the BBQs if the weather’s cooperating. 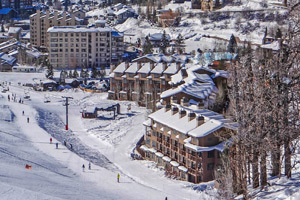 Get recommendations on some of the best walk-to options in the ski village, hop the free seasonal shuttle into downtown Steamboat – or go all out with a horse-drawn or snowcat-pulled sleigh ride up to dinner on the mountain. There’s even a snowmobile/dinner option in Routt National Forest as well. Keeping it simple with takeout and an evening in? Queue up a DVD or two, gather around the gas fireplace in your cozy living room and call it perfect. Split your time between the charmer of an Old West downtown and all the action at the base. Gondola Square is home to open-air concerts and movies during the summer, plus live reindeer and even a cookie decorating tent for kids during the holiday season. Horse-drawn rides whisk you away to a lodge for dinner, in sleighs or wagons, depending on the season. Downtown, you’ll find historic Howelsen Hill – for epic snow-tubing, and a 2,400-foot alpine slide in the summer months. While you’re there, stroll the boutiques and galleries while perusing menus for potential dinner-place candidates – options abound. And you may want to institute a “must share with parents” policy before handing each kid a small bag to fill at the local candy shop.